The nearest airport is Mineralnye Vody. Though it's called "international" but in fact the list of destinations in other countries is quite short. It appears to be optimal to fly first to either Domodedovo or Sheremetyevo or Vnukovo airport in Moscow and then to Mineralnye Vody. The LOC is planning to meet all participants in the airport of Mineralnye Vody and organize further transfer to Kislovodsk, so please let us know the time of your arrival as soon as you book the tickets. Of course it's possible to get to Kislovodsk by public transport or taxi. You can book a taxi on a desk in baggage claim area. The drive from airport to Kislovodsk costs appox. 650 rubles (22 USD). Also it's possible to get from Moscow directly to the center of Kislovdosk by train which is traditional mode of transport for Russia. The ride will take about 25 hours and costs about 5000 rubles, train number is 4. This option may appear interesting for them who wants to look at central part of Russia from window of train. The train passes such cities as Ryazan, Voronezh, Rostov-on-Don, Mineralnye Vody and Pyatigorsk. Kislovodsk is located in the picturesque valley, surrounded with slopes of the main Caucasian ridge. The main riches and proud of the city is mineral springs, thereby Kislovodsk became a famous resort. The city represents great cultural value because in the late 19th and early 20th centuries, Kislovodsk as a fashionable spa attracted many musicians, artists, and members of the Russian aristocracy. The weather in Kislovodsk in October is usually sunny and warm. 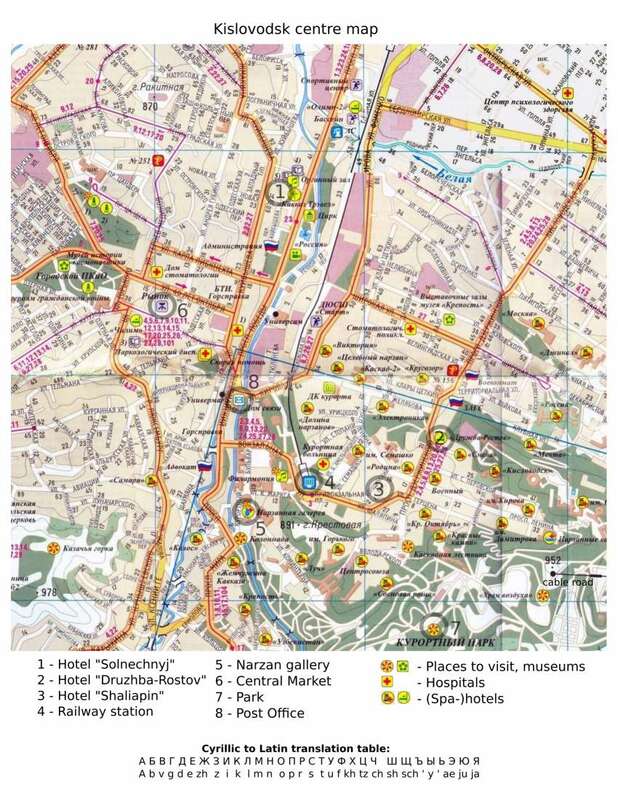 Here you can find a map of Kislovodsk with important objects. Some photos are also available in our photo galery. Economic double room, meal excluded - 570, 681, 780 rubles per person per night depending on size of room. "Drujba-Rostov"
Economic single room, meal excluded - 680 - 1362 rubles per person per night depending on size of room. "Drujba-Rostov"
For your reference: the official exchange rate (USD CB RF and EUR CB RF) can be found at http://www.rbcnews.com/. The expected date of your entering Russian Federation. The expected date of your departure from Russian Federation. Cities you are going to visit is Russian Federation (including e.g. Moscow and Mineralnye Vody). The city where you will apply for your visa to a Russian consulate. The country where you were born (if it's not obvious from passport scan). Affiliation (complete name of your institution). Your position at your affiliation. Invitations for all paticipants which have submitted this information will be sent by express mail to participants in mid-September (for european citizens a little earlier). With this invitation you will be able to apply for a visa. But maybe you will need hardcopy of invitation only in moment of obtaining of visa while application could be made with scan of invitation. We recommend you to contact embassy/consulate where you will apply for visa and ask them about procedure. Please note that usually it takes about 5-7 days to obtain a visa with official invitation. Starting from August, 24 LOC cannot guarantee success in obtaining official invitation for business visa. However you can still obtain a touristic visa through tourstic agency in your country. See for example Visadienst or visa to Russia. If you have any problem with obtaining the visa please inform us site2010@sai.msu.ru.